Paper Pieces of Me: Kitschy Kitchen Recipe Album (Part 2) ~ Featured on Melissa Frances Blog!!! 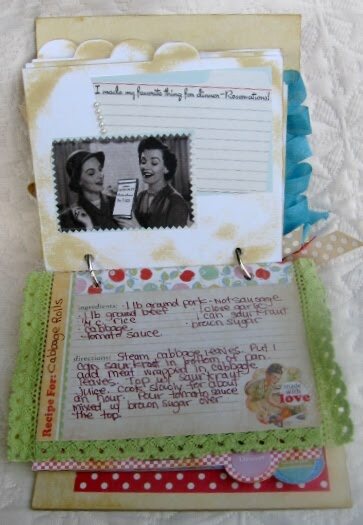 Kitschy Kitchen Recipe Album (Part 2) ~ Featured on Melissa Frances Blog!!! I am editing this post because I just saw that my Kitschy Kitchen Album was featured on the Melissa Frances blog! What an honor!! I am downright floored with excitement. CLICK HERE to hop over and check it out. HUGS! Some more Yummy for your Tummy, and your eyes hopefully. :) This is Part 2 of my August design team project for Mystic Paper. 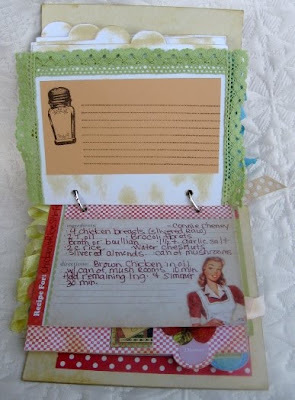 If you missed Part 1 of my Kitschy Kitchen Recipe Album, CLICK HERE to view that post. 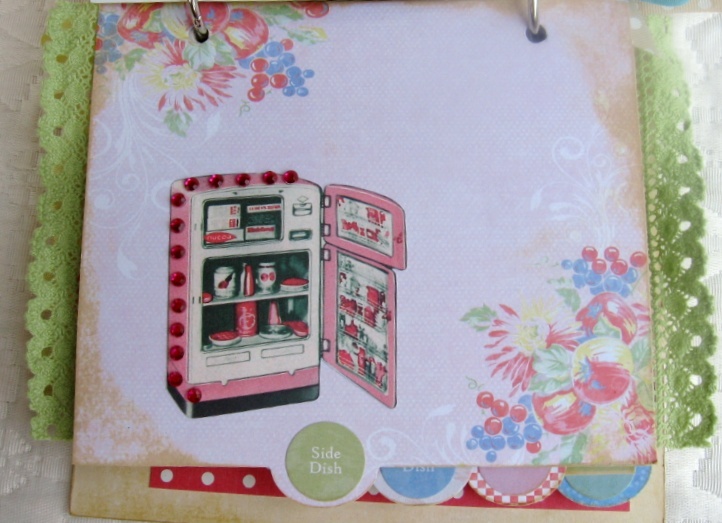 Check out this pink refrigerator (Crafty Secrets Homemade image pack). 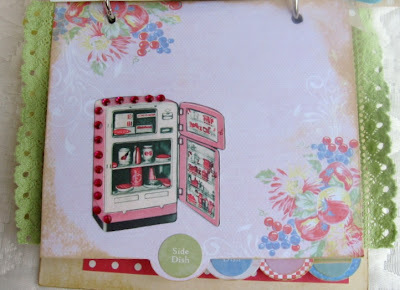 It's so nifty fifties and of course I had to bling it up with the rhinestones from my Melissa Frances kit. 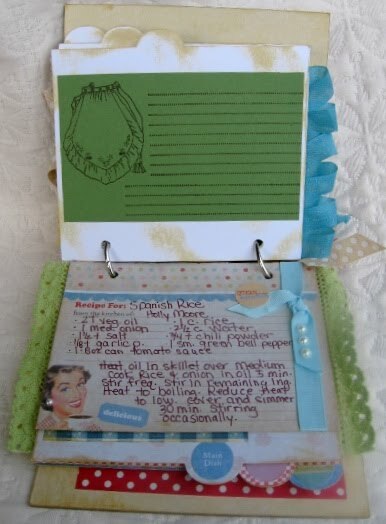 Cute, perfectly colored blue grossgrain ribbon and pearls from the kit add the perfect pizazz to this side dish recipe. And the apron stamp above. . . swoon! So this dish isn't exactly Kitschy, but the color is pretty, and I love it, so it made it into the book. I added a little Graphic 45 Domestic Goddess paper to look like a placemat, and a Crafty Secrets silverware image. I LOVE this celery colored lacy trim from Mystic! 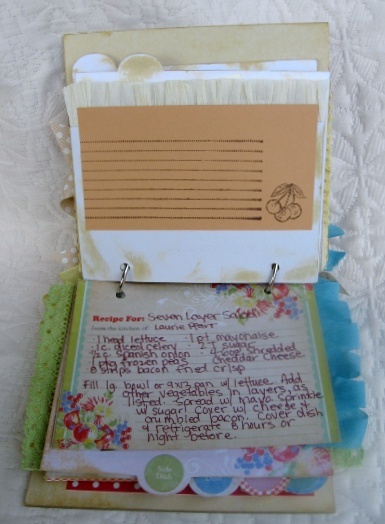 I bordered an entire recipe card with it, and it's fun how it sticks out so you can see it when the album is shut. I am pretty much addicted to vintage seam binding right now. The soft feel of it in my hands and on my projects just makes me so happy!! The brighter yellow is perfectly kitschy, don't you think? So, are you enjoying my album so far? I hope so, I had such fun putting it together. Everything is available at Mystic Paper, and you can visit the store if you would like to see my book in person. 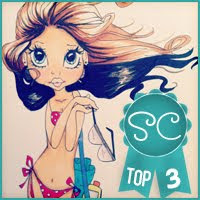 Also be sure to check out the projects completed by the other design team members, Sheri and Jenna. I saw your beautiful work on MF....Congrats!!! 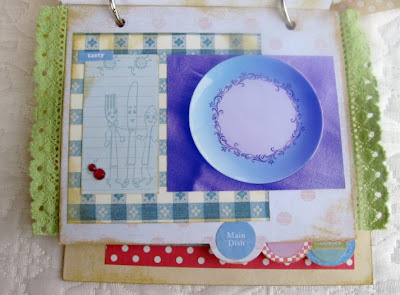 I just love your cute pages, what a sweet project. Well that's just darn cool, Holly!! Hi Holly... it's Holly! Your album is gorgeous! Yes, they are so much fun to put together. Hope you're having a great week! Thanks for stopping by my blog, I had no idea about the MF blog - thanks for giving me the heads up! I love your album - so sweet! I also love the addition of G45 papers!